The innovative hospital gown is custom-made for breast care patients. London Ontario – It’s a designer gown that will never make it to the runway but is a big hit at St. Joseph’s Hospital in London. Inspired by patients and staff, the fine details are dignity, comfort and versatility, making this one-of-a kind hospital gown haute couture in the Breast Care Centre. 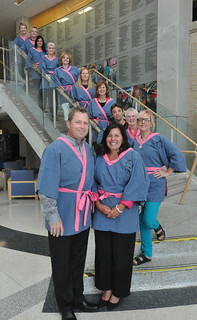 The new hospital gown, made specifically for breast care patients, was a collaborative effort of St. Joseph’s Health Care London and London Hospital Linen Service (LHLS). After looking at existing products and finding they didn’t fit the needs of both patients and the hospital, the two organizations sat down at the drawing board. The goal was a one-size-fits-all gown that was comfortable, respectful and user friendly for patients, functional for both surgery consults and breast imaging, and could hold up to repeated laundering without increasing the hospital’s laundering costs. View CTV London's video coverage.